Welcome to Found Around The District, where we highlight fascinating cars we find around a city where people are too busy fighting through traffic and hunting for parking to drive anything interesting: Washington, D.C.
Man, is this thing a far cry from the cushy-but-competent Range Rover I tested a few weeks ago. While that car was a very impressive off-roader, many of you mentioned in the comments of my story that you'd like to see Land Rover bring back their more utilitarian SUVs, like this Defender 90 here. I wholeheartedly agree. 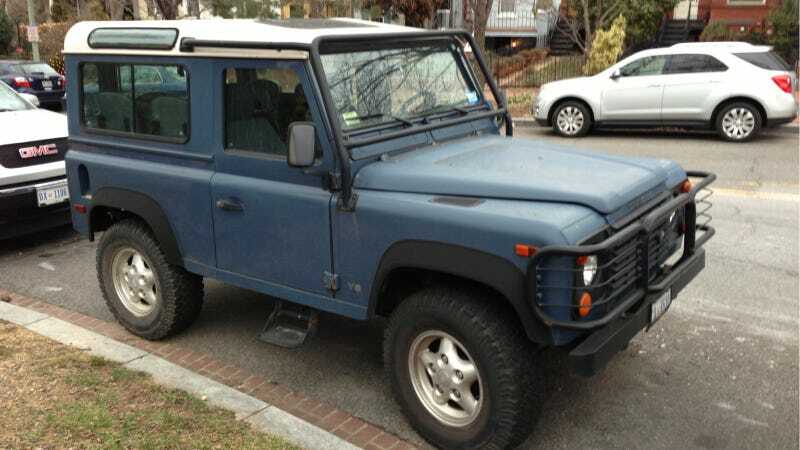 The Defender was launched in the early 80s as a kind of modernized version of the original safari-going Land Rover. It made it to the U.S. and Canada for a few years in the 90s until increased safety regulations and a desire to sell more upscale SUVs caused Land Rover to pull the plug. They still make them, but they don't come stateside. Only about 7,000 were brought over, so they're kind of rare here. Here, it packed either a 3.9- or a 4.0-liter V8, depending on the year, as well as tough-as-nails 4WD system. As this one has an automatic transmission, I believe it's a 1997 model, but one of you may know better than I do. In terms of styling, it's unapologetically rugged and boxy, built for rock climbing, not trips to the salon. I think it looks great. Do you want to see the Defender make a comeback?